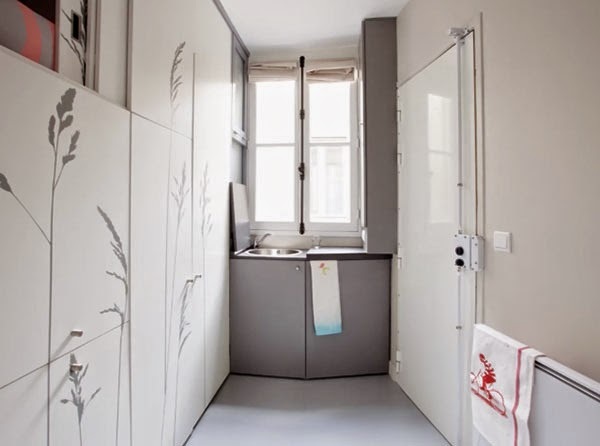 A utility room in a building in Paris measuring 8 sqm (86 ft) is converted into a functional and easy to live apartment. The bookshelves, bedroom, wardrobe, storage, small dining/work table, and fully equipped bathroom is hidden behind the wall and accessible through closet doors. There is also a kitchenette with fridge, a microwave and removable cooktop. This may be the smallest apartment in Paris but it looks comfortable and cozy. Kitoko Studio is a multidisciplinary practice of contemporary architecture, interior design, urban planning and landscape. The studio is also involved in furniture design projects.